Hello. This is a Korean in America. Today, I will discuss the J-drama series “Starman ~ Kono Hoshi no Koi”. While a huge fan of J-dramas, I have not done review of them except for my “Seeing double Series” of articles. However, watching the current crop of poor K-dramas, I had a yearning to talk about some J-dramas. And the one I selected is “Starman ~ Kono Hoshi no Koi” which is an extremely weird choice since it is not the best example of J-dramas. The story is odd and the overall structure of the series is a mess. In addition, the ending is outrageous because it’s so abrupt and not actually special. However, as failure can show more than success, I chose this J-drama to talk about. That previous statement was so series…To be truthful, I want to talk about “Starman” because it is so odd ball mess that still has a lot of charm. But still very odd! The plot is centered around Uno Sawako, a single mother with 3 children, living in a small town where nothing really happens. Think Japanese version of the Twin Peaks’ Town. But, instead of crazy, weird people living there, normal, simple, and nice Japanese people live there doing just normal things. Uno Sawako played by the legendary, Hirosue Ryoko, who works as a kitchen staff at a local food mart and spends what free time she has with her friend Suda Misao who runs a small pub. She is played by Koike Eiko who made a career of playing off beat best friend. Then, one day, she finds this young guy with no memory and lies that he is her husband to him because she is lonely and he is cute and seems nice. So, at this point, if you have seen any kind of romantic comedy with this type of setting, the plot will form in your head. For a K-drama, the series “Fantasy Couple” will come to mind. But you will be wrong! Very wrong! Even though this town is not Twin Peaks, it is nowhere near normal. Not only is Uno Sawako weird for to come up with the idea to lie about the stuff, she just runs with it even though she has no confidence to pull it off. This is the same for her mother, her children, and her best friend. Then you expand to the people around her at work who are all quirky and odd. You have a girl who believes in aliens. You have this old grandpa that seems just a kind but grumpy old man but something seems off. This odd quirkiness is a good description of the series. “Starman ~ Kono Hoshi no Koi” is not a classic J-drama because the show is a mess structurally and thematically. First, other than being quirky, there is no theme or point to the series other than romance. While, if this was just a generic romantic comedy or a typical K-drama, this would not be an issue. However, if you see the direction the show goes, you cannot imagine the show was just about romance. Second, structurally, there is a significant tonal change throughout the series. The series initial starts out more like a quirky drama-comedy surrounding the amnesia as you would expect. There is some foreshadowing of what the series will become but you won’t get how bonkers the series will become in the latter half of the series. Really bonkers! 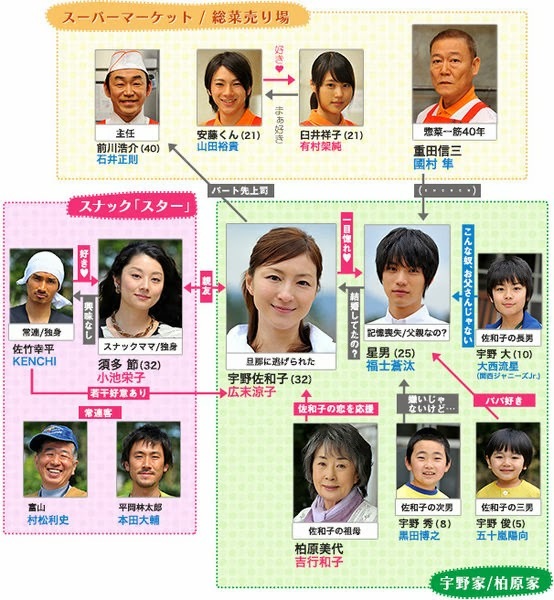 It is the actress, Hirosue Ryoko, who really makes the difference in the series and elevates it to something more. I have always had a huge crush on Hirosue Ryoko ever since I saw “Beach boys” and “Shotgun Marriage”. She was always able to delivery humor, emotion, and cute quirkiness in all her performances. And she is still able to do the same while adding maturity as she aged into new roles. “Starman ~ Kono Hoshi no Koi” is her vehicle. While, all of the actors are great with this quirkiness, Hirosue Ryoko is gold in every scene she is in which is like 75 percent of the series. She is the straight man to all the craziness of the series but she just seems to absorb all the craziness like it was nothing and delivery great performances. I especially like her chemistry with Koike Eiko who does her best friend role like a pro. I just wished the series was given more development time to warrant her performances. In the end, as an example of great J-drama, I cannot recommend “Starman ~ Kono Hoshi no Koi. It is too off the wall and directionless! However, if you love the quirkiness of J-drama in which actors pushed to do more than just be a pretty face and develop odder but interesting characters, “Starman ~ Kono Hoshi no Koi is not a terrible series. Especially, if you are a Hirosue Ryoko fan, it is a must see! Just get ready for the craziness to kick in during the latter parts of the series. If you have enjoyed this article, please donate $1 to keep the lights on. Thank you.